Aadhaar has become the most trusted instrument for administering services and subsidies for the government. Stories about Aadhaar being made mandatory for services is a daily routine. This is when the supreme court is yet to deliver its final verdict on whether the 12-digital number can be made mandatory by the government. In a long list of services mandating Aadhaar – namely the employee’s provident fund, public distribution system and scholarship, among others – the government has added a few more. The ministry of human resource development has set a deadline of June 30 for students to produce their Aadhaar card to receive midday meals in schools. Following HRD’s footsteps, the ministry of women and child development is mooting to make it mandatory for over one lakh homeless children living in about 9,000 orphanages. In another announcement, the ministry of chemicals and fertilizers have given a similar deadline for Bhopal gas tragedy victims to produce their unique identification number to avail compensation. The government's position on Aadhaar is a clear violation of the supreme court rulings, stating that the unique identification number cannot be made mandatory. The SFLC has made a list of 120 cases where the government has violated the SC ruling between September 2015 and September 2016 (see box). The recent notifications attracted sharp criticism from the civil society. In response, the government issued a clarification on March 7, stating that no one would be denied benefit till the time Aadhaar number is issued. According to lawyer and civil rights activist Apar Gupta, the clarification on Aadhaar reiterates existing notifications like those on midday meals. “You must have an Aadhaar or enroll. Without application you go hungry,” Gupta tweeted. 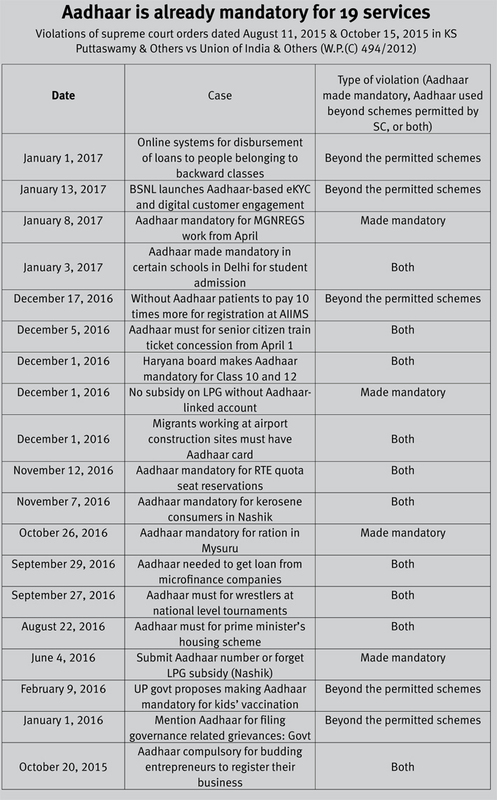 Moreover, there is no clarity about the impact of Aadhaar on the delivery of these schemes. Making Aadhaar mandatory for midday meal scheme might deprive several lakh children from receiving food in school — a scheme, first introduced at the national level in 1995, which significantly contributed in increasing student’s attendance at schools. It is highly unlikely that the UID integration will lead to the improvement in the quality of food and eatables served at schools and aganwadi centres. It is not very clear how Aadhaar will be used to track the missing children from orphanages. On the contrary, the government has aggressively rebuked public apprehension about the possible use of Aadhaar in surveillance. Even if it is used for tracing the missing children, how effective will it be is not clear yet. Aadhaar originally derives its power from the ability to weed out ghost beneficiaries, that is, fake names on record, and multiple beneficiaries. If used with discretion, Aadhaar can plug the mammoth leakages in the PDS, and improve it for the targeted beneficiaries. However, the government at the central and state level are linking it randomly to any scheme and making it mandatory. The biometric identity system also poses a serious challenge to an individual’s right to privacy. 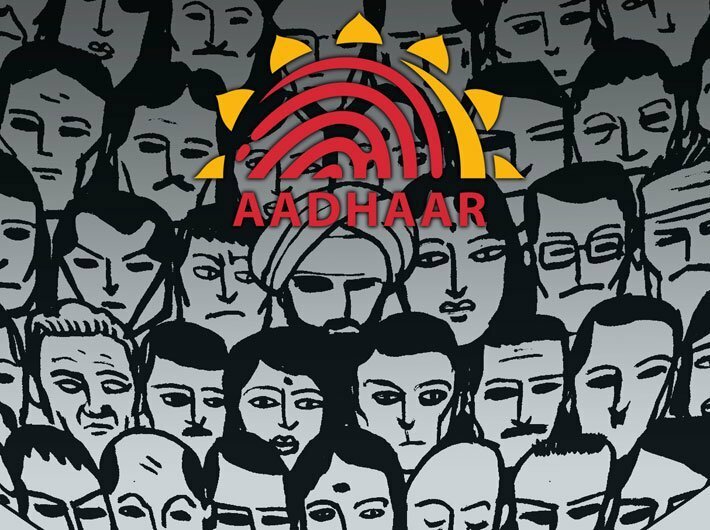 Although the project proponents including former UIDAI chief Nandan Nilekani had earlier stated a need for a separate law to safeguard privacy, the present government is going in the opposite direction. It has told the apex court that privacy is not a fundamental right. It doesn’t end there. Recently the UIDAI has filed a police case against ‘unknown’ people who appeared in a video exposing a possible flaw in the Aadhaar authentication system.